After being tethered to Apple’s recently released television add-on since last Thursday, all that is Apple TV is beginning to make itself clear. You have questions? I have answers. I have a protected network. Can the Apple TV use it and, if so, how do I set it up? Yes, the Apple TV can access your protected network. When you first set up your Apple TV, you’ll be asked to connect to a network. If you have some variety of network protection switched on, you’ll be asked to select your flavor of protection. Press the Apple Remote’s Play/Pause button and, in the resulting screen, you’ll see a virtual keyboard. Use the Remote’s direction buttons to navigate to the characters you want and press Play/Pause to choose them. When you’re done, navigate to Done at the bottom of the screen and press Play/Pause to confirm the password. The Apple TV should now join the network. My network doesn’t appear in the list of available networks. How do I tell my Apple TV about it? Much like with Apple’s AirPort, you have the option to choose Other from the list of networks. When you do, the virtual keyboard appears again. Enter the name of your network, select Done, and press Play/Pause. With luck, your network will become available. I need to manually enter an IP address for the Apple TV. Can I do that? Yes. In Network setup you’ll see the option to enter an IP address manually. When you choose this option, you’ll see 12 blanks for the IP numbers. Use the Remote’s Plus and Minus buttons to scroll up or down through the selected number. Use the Forward and Back buttons to select other blanks. Finally move to Done and press Play/Pause to confirm the address. I need to change my network settings after the initial setup. How do I do this? From the Apple TV’s main screen follow this path: Settings/Network and choose either Configure Wireless or Configure TCP/IP. I’m seeing some glitches. Is there some way to check the strength of the wireless signal my Apple TV is receiving? Yes. Again, follow this path: Settings/Network. On the Network screen you’ll see a five-segment Signal Strength meter. 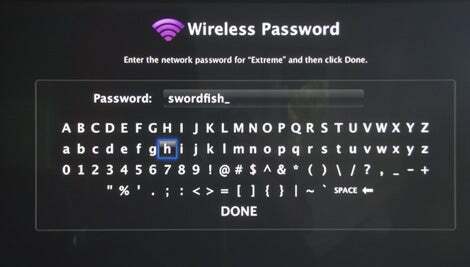 This screen also displays the name of the network the Apple TV is connected to, the Apple TV’s IP address, and its wireless ID. The Apple TV’s About screen also bears a Signal Strength meter. I plan to attach an Ethernet cable to my Apple TV but I also have wireless in the house. How can I force it to use Ethernet, which I’m pretty sure will produce a more reliable signal? Force isn’t necessary. If you jack an Ethernet cable into the Apple TV, it will use that connection by default. I don’t have a wireless router. Do I have to have one? No, but you may be happier if you do. You can plug the Ethernet cable from your DSL or Cable modem into a Macintosh that bears an AirPort card, turn on Internet Sharing in the Sharing system preference, and configure it so you’re sharing your Ethernet connection to any devices accessing your Mac wirelessly. This includes your Apple TV. Launch iTunes on that computer and when you set up your Apple TV, direct it to look to that computer for its network connection. Be sure that iTunes Sharing is allowed if you’ve switched on a firewall. Why may you be happier going with a router? I’ve found the wireless signal coming out of a router far stronger than that coming from an AirPort card embedded in a Macintosh. I understand that the Apple TV supports wireless networking protocols 802.11b/g/n. How does it really perform with these varieties of wireless? It performs remarkably well with 802.11g and n networks. I’ve streamed long movies—both those purchased from the iTunes Store and those I’ve encoded myself at high bit rates (2,500kbps, for example)—and they play end-to-end flawlessly over both my original g-flavored AirPort Extreme Base Station and the new n-variety AirPort Extreme Base Station. The newer “n” Base Station offered a full-strength signal at 5 bars whereas the lower-range “g” Base Station provided just 2 bars, yet still delivered the goods. When streaming video, it takes a few seconds for the movie to load into the Apple TV’s buffer and then it begins playing. When you skip chapters or press and hold the Remote’s Forward button to fast-forward, playback stop, the stream buffers to the Apple TV for a few-to-several seconds, and playback begins anew. Music flows nicely as well. I’ve also tested the Apple TV with my wife’s old lampshade iMac, which bears an 802.11b AirPort card. Music playback is perfectly fine. Video, on the other hand, is less than perfect. I streamed a version of It’s a Mad, Mad, Mad, Mad World , encoded as an MPEG-4 movie at a resolution of 720-by-288 and a total bitrate of 2,391kbps, and it played smoothly for just over 8 minutes. At that point playback stopped and the Apple TV refilled its buffer. It stopped again at just over nine-and-a-half minutes to replenish the buffer. 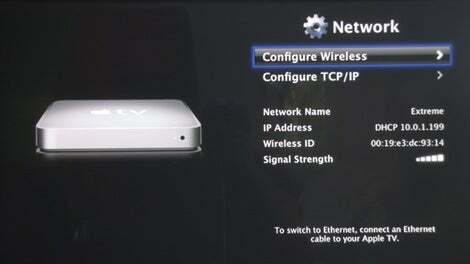 In short, for solid video playback, use a g or n wireless network or a wired Ethernet network. If there’s no real difference in performance between a g and n network, is there any reason for me to buy a new AirPort Extreme Base Station to go with my Apple TV? If you already have the g-variety of the AirPort Extreme Base Station (or another variety of g wireless router) I’d set it up with your Apple TV and see how things go. If everything works smoothly, stick with what you have unless you have another compelling reason to purchase a new Base Station. One compelling reason would be range. The latest AirPort Extreme Base Station has much better coverage than the previous one. My office with its base stations is downstairs and the Apple TV and my wife’s iMac is upstairs. With the old g-flavored Base Station I get just two bars from the Apple TV and nothing from my wife’s iMac unless I have an AirPort Express Base Station to extend the network’s range. No such Express Base Station is necessary with the new Extreme Base Station. Both the Apple TV and the iMac get a full five bars without the need of an AirPort Extreme. Man, syncing seems slow. Should it be? It can be, yes, particularly over wireless b and g networks. 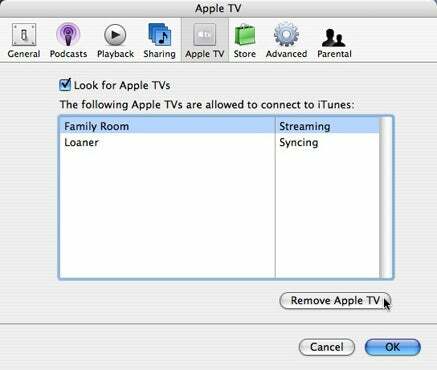 If you attempt to stream content while the Apple TV is syncing, the Apple TV may stop syncing to let streaming take place. For this reason, your Apple TV will complete the sync more quickly if you leave it alone. If you plan to copy a lot of material to your Apple TV’s hard drive, you may find it less painful to do it overnight. By the time you wake up, the job will be done. But must I wait for the Apple TV to sync all my media before playing it? No. By selecting the Apple TV in the Sources screen you can play any media that’s been copied to it even while other media is syncing. Again, it may stop syncing or sync more slowly when you do this. No. Photos must be copied to the Apple TV in order to appear on your TV. This means that you can display only the photos from the computer synced to your Apple TV. If you sync to a different computer, the photos from that computer will be copied to your Apple TV and the photos from the other computer will be deleted. Hold on a second. You mean when I sync with another computer the Apple TV loses the old photos? Yes. And your old music, videos, and podcasts too. A bit like an iPod, the Apple TV is fully associated with only one computer. When you initially sync the Apple TV with a Mac or Windows PC, you tell it what you’d like to sync (read: Copy) to it and it copies as much of the requested material as possible. (It prioritizes which material goes on first in this order: Movies, TV Shows, Music, Podcasts, and Photos.) If it fills with movies, no TV shows, music, podcasts, or photos will make their way to the device. If you choose to sync the Apple TV to another computer, you don’t have the option to keep any of the material copied from the previously synced computer. As far as syncing is concerned, the Apple TV is completely monogamous. Well, that stinks, doesn’t it? It would if the Apple TV didn’t offer some other way to play content from other computers. Fortunately it does. It can stream media—movies, TV shows, podcasts, and audiobooks—from up to five other computers, and this can be a combination of Macs and Windows PCs. I have a lot of computers. What happens when I’ve already connected five computers and want to add a sixth? You have to perform the Apple TV equivalent of an iTunes deauthorization. To do so, move to iTunes’ preferences on the computer you want to deauthorize, select the Apple TV tab, select the Apple TV, and click the Remove Apple TV button. Once you’ve freed up the authorization, return to the Apple TV, choose Sources/Connect to New iTunes, note the PIN number that appears, move to the computer you want to authorize, select the Apple TV entry in iTunes’ Source list, and enter the PIN number to enable streaming between the Apple TV and the computer. Do I have to perform this PIN dance every time I want to stream to one of my computers? No, once you’ve added a computer for streaming it will remain on the Apple TV’s list until you remove it by following the technique outlined above. If I play content purchased from the iTunes Store does that count against my iTunes authorizations? No. As long as the computer you’re syncing with or streaming from is authorized to play the iTunes purchases, they’ll play on the Apple TV.